From top to bottom, the OS that powers the iPhone, iPad, and iPod touch has been renovated for both looks and usability. Apple has taken the wraps off iOS 7, revealing a dramatic new design that sheds six-year-old interface elements, and replaces them with a cleaner, more modern aesthetic. "It's the biggest change to iOS since the introduction of iPhone," Apple CEO Tim Cook said during Monday's Worldwide Developers Conference keynote. The entirety of the OS and the stock apps have been redesigned with a new, dramatically different flat look. The typography and icons have all been revamped. There's a sense of planes of data: Translucent textures reveal what's in the background. Backgrounds change in a parallax effect when you move the phone: As you do so, things in the background move around ever so slightly behind frontmost elements. Animations receive an overhaul, too. A new approach to multitasking shows large previews of your running apps that you can flip through. And a new panel, which you drag up from the bottom of the phone's screen, reveals access to all sorts of quick controls for toggling settings. Apple senior vice president Craig Federighi showed off redesigned apps including Weather, Calendar, Mail, Messages, and even Phone. Game Center loses its green felt entirely; wood is gone from iBooks. 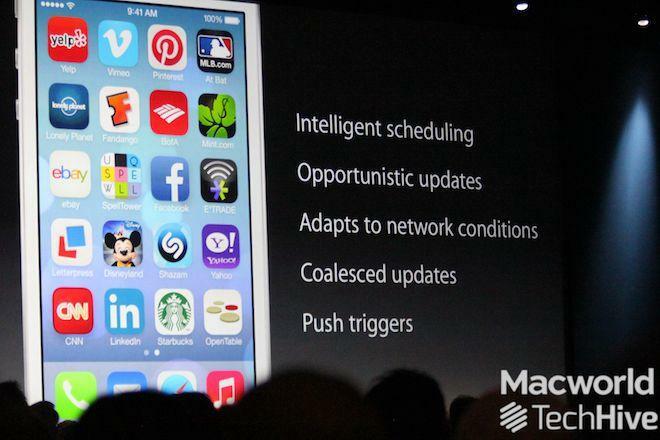 Even apps like Stocks and Compass have a new look with "precision and a sense of purpose," Federighi said. The updated Calendar app looks very different, with some design elements seemingly inspired by third-party apps like Calvetica and Fantastical. A new gesture lets you swipe from the left edge of the screen to go back one level in Messages and Mail. And you can slide across messages to move them or trash them--a la Mailbox. Notification Center scores a new look too, along with tabs that filter notifications for "today," "all," and missed. And Notification Center is now available from the lock screen. Folders on iOS can now contain multiple screens' worth of apps. "Installing iOS 7 on your phone is like getting an entirely new phone, but one that you already know how to use," Federighi said. Control Center is sort of like Notification Center: You swipe up from the bottom of the device to access it. iOS finally adds a centralized hub with Control Center, You can turn on Airplane Mode, toggle Bluetooth, turn on Do Not Disturb, enable lock rotation, access AirDrop, and quickly access specific apps. 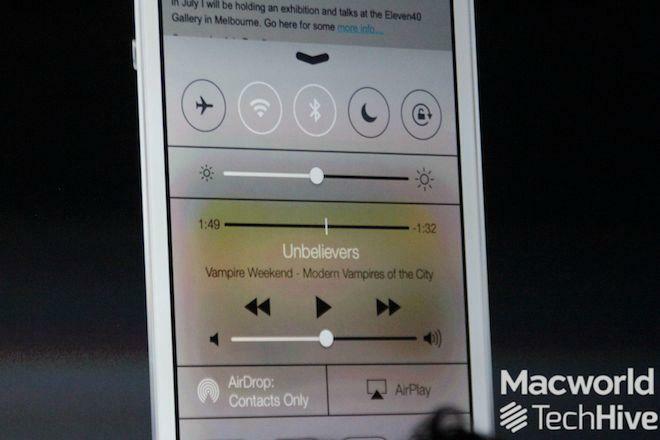 You also use Control Center to adjust playing tracks, and more. The feature also works from the lock screen. There's a flashlight now, too, so if you wake up in the middle of the night and need to find something, you can grab your phone, Federighi said. iOS 7 also adds "opportunistic updates." If the phone is on and in use, and the network conditions are good, it pulls more background data. And push notifications can trigger background processing for an app, too. 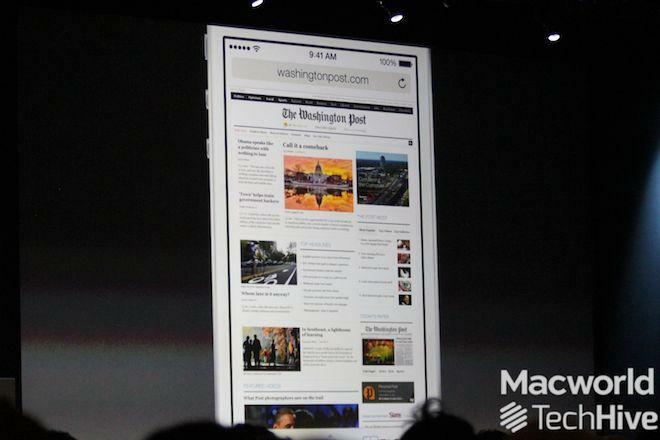 "Safari is the most popular mobile browser in the world," Federighi said. The browser now includes a unified search field, akin to the location bar in desktop Safari, which lets you enter in both URLs and searches. New views make browsing your tabs and frequently accessed sites more simple. Type-ahead suggestions offer URLs and Google search results alike. The location bar recedes as you scroll through a page, offering more visual space to the webpage's content. You can use that same new "swipe from left" gesture to navigate back a page, too. The new tabs interface in Safari is eye-popping, and you aren't limited to just eight. You see large previews of your visited pages in a vertically scrolling list with interesting perspective. You can drag tabs to rearrange them, or flick them away when you don't need them anymore. Any app that supports the Share Sheet gains access to AirDrop: Your friends who are near you appear right there. When you tap to share, your friends can choose to accept the data you're sending, and the appropriate app launches on their devices, too. It uses peer-to-peer Wi-Fi for maximum transfer speeds, so there's "no need to wander around the room, bumping your phone," Federighi said. 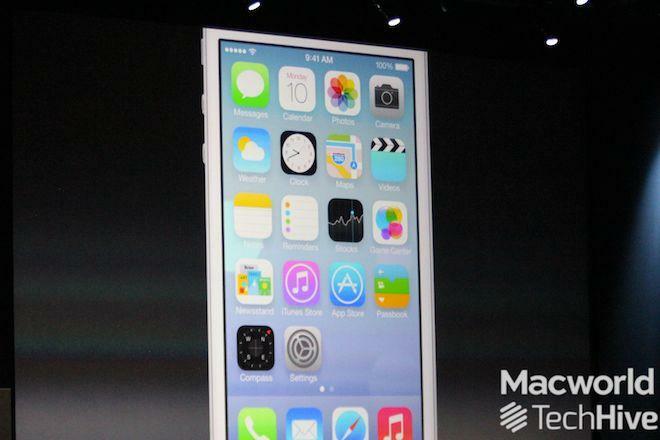 The Camera app is now "four cameras in one," Federighi said. It's a video camera, still camera, square camera, and panorama camera. And still photos can include filters, which can generate live, real-time previews. 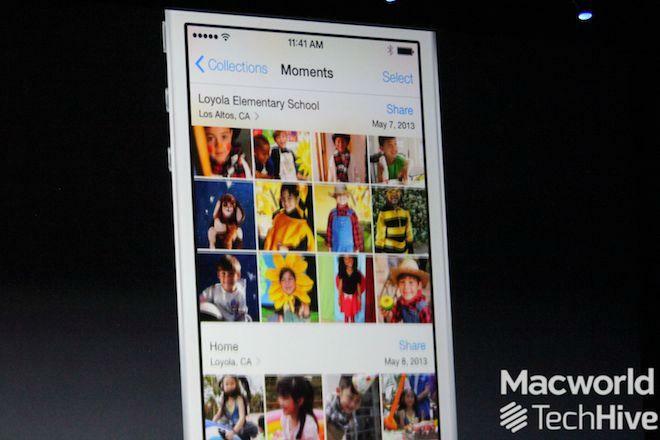 The updated Photos app now offers Moments, which better organizes your photographs without your needing to intervene. Like iPhoto's events on the Mac, Moments can analyze your photos' location data and dates to assemble your photos intelligently, and label them in more useful ways than an endless grid of photo thumbnails. "You may not remember when you did it, but iOS does," Federighi said. The Photos app also gains access to iOS 7's new filters, and it gains new sharing options, too. In addition to AirDrop support, you can share photos via iCloud--which is how Photo Streams are labeled in iCloud. For the first time, other people can share into your Photo Stream, too, allowing friends and family members to mutually share photos together. And Photo Streams now support videos as well. Apple senior vice president Eddy Cue talked about Siri. Siri gets a redesign in keeping with iOS 7's look--and it gains a new voice, too. Actually, it gets two new voices: a male and a female option. 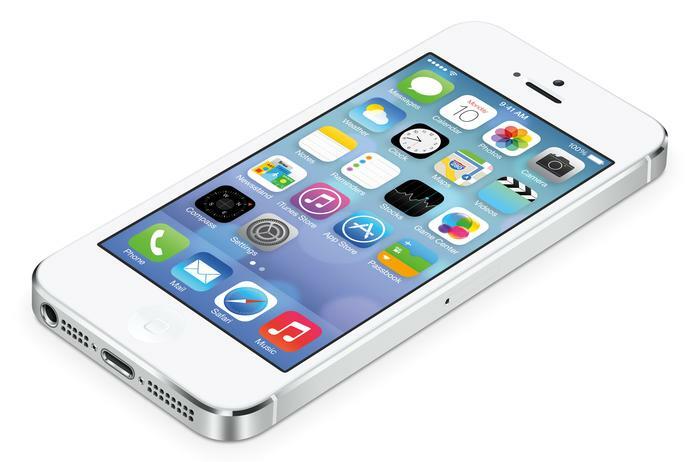 German and French speakers have voices of their own to enjoy in iOS 7. Siri can control a lot more, too: "Play my last voicemail," "Turn on Bluetooth," "Increase my brightness," are among the controls the personal assistant now understands. Siri can also answer more questions, and it integrates with Twitter and directly incorporates Wikipedia. In a not-so-subtle clue as to the status of the Apple-Google relationship, Siri will get its search results direct from Microsoft's Bing. Another new feature Cue showed off was iOS in the Car--which integrates Siri, too. The feature would work with in-dash displays on many cars, and shows your apps. A slew of car manufacturers will offer integration with the feature starting in 2014, Cue said. "It's way easier to find apps than ever before," Cue said. There are new sections for finding apps for kids, and a new option to browse "apps near me." That way, if you're at a specific spot where certain apps are popular, they're easy to surface. Cue called the iOS 7 Music app "the best music player we have ever done." You don't just see your content on your device; you also see all your iTunes in the Cloud purchases--not just for music, but for movies and TV shows too. Cue also introduced iTunes Radio, a new way to browse music on your iOS device that's built into the Music app. iTunes Radio includes a set of featured stations curated by Apple's music editors, along with music that's currently popular on Twitter. You can share stations with friends, or create new stations based on specific artists. You can skip ahead past songs you don't want to hear, too. Apple only previewed 10 of iOS 7's new features on Monday, but more are coming when the update is released this (Soutehrn hemisphere) Spring, if the company's last iOS 7 slide is any indication. 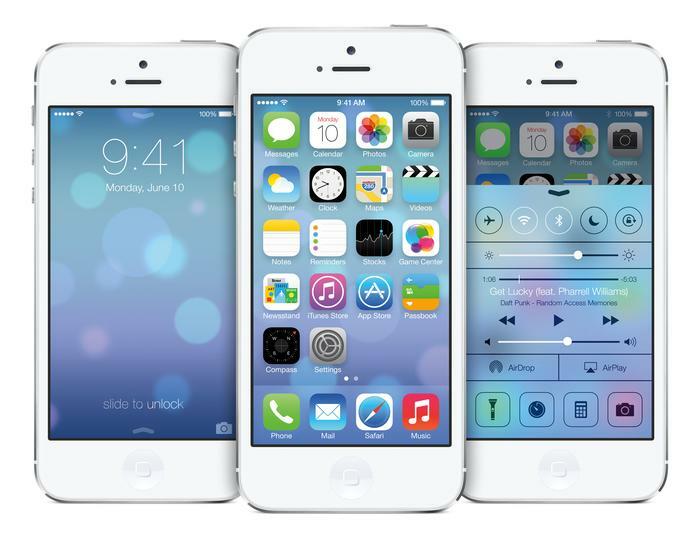 iOS 7 will be available as an upgrade for the iPhone 4, 4s, and 5, iPad 2 and later, iPad mini, and the fifth-generation iPod Touch.